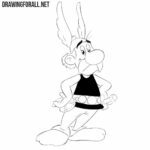 We are all familiar with Asterix and Obelix – two Gallic warriors and colorful characters from the eponymous comics, cartoons and films. 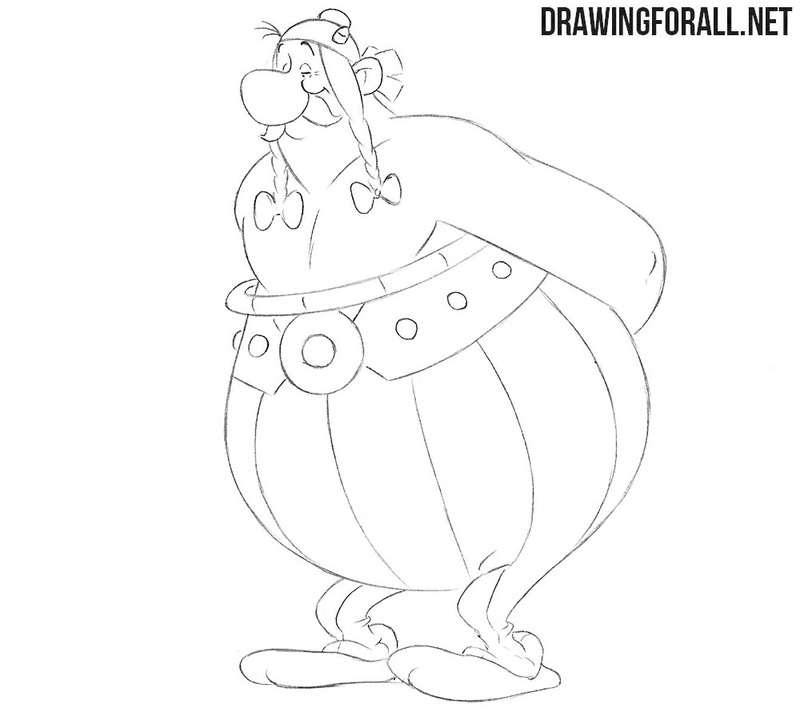 In one of the previous tutorials we showed you how to draw Asterix, and here we will show you how to draw Obelix. As in the lesson about Asterix, we start with the most basic contours. First of all, we outline our head in the form of a half-oval. 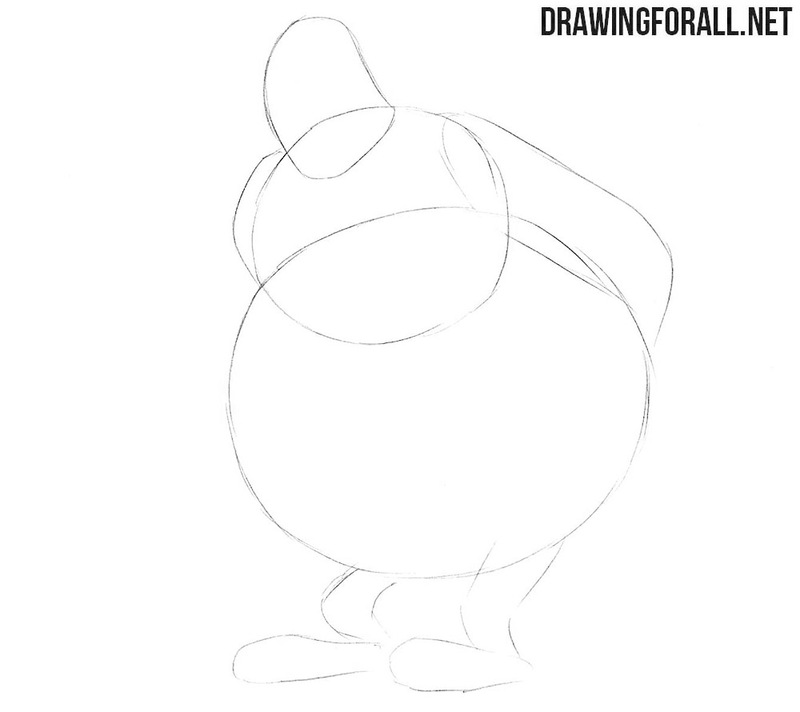 Next, we outline the torso in the form of two circles. 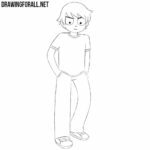 We finish this step by sketching arms and legs. All lines must be made with very light lines. Let us now outline the most basic details of the Obelix drawing. Start with the head, sketching the eyes, nose and mustache. Next, we outline the helmet and hair. After that, we move a little lower and carefully draw the outlines of the belt. As in the previous step, we will use very light lines. 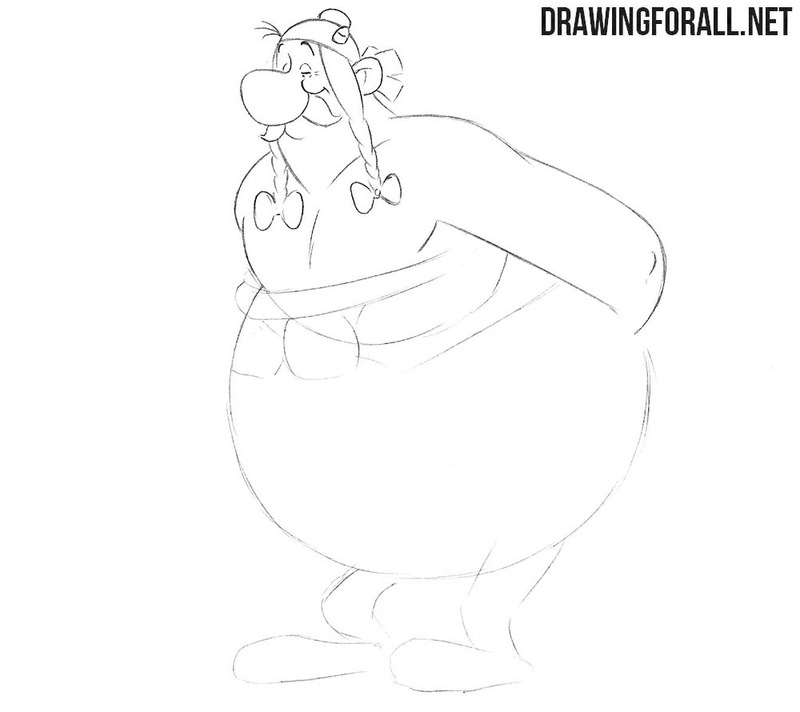 This will be a rather simple step of the lesson on how to draw Obelix, in which we will draw the face in detail. With the help of clear lines gently draw the outlines of small eyes. Next, draw a large and rounded nose, cheeks and mustache. 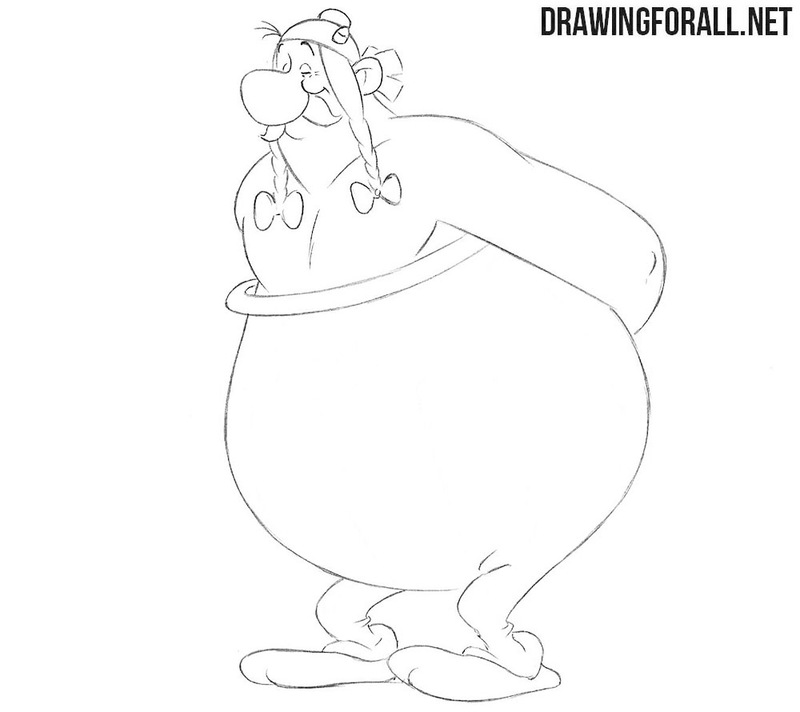 We continue to draw the head of Obelix. Here we will need to carefully draw the outlines of the helmet. In the same step we draw the outlines of hair and rather large ears. Remove all unnecessary guidelines and proceed to the next step of the tutorial about Obelix. 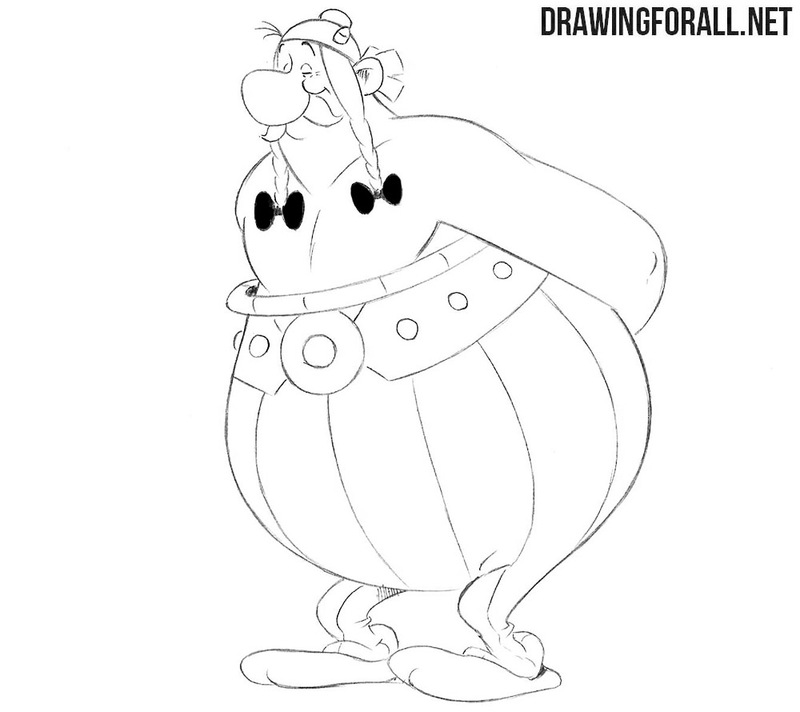 Let’s now work with the upper body of Obelix. Continuing the lines of the neck, we carefully draw the outlines of the shoulders, which smoothly pass into the arms behind the back. 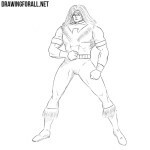 Next, carefully draw the outlines of the pectoral muscles of the Gaul and remove unnecessary guidelines from the torso. Now draw the outlines of a large characteristic belt. 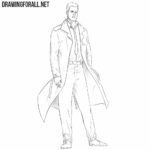 Next, draw the outline of the torso and legs. Note that the obelix has a rather large belly and thin legs. In the same step, we draw the longitudinal lines on the pants and clear the drawing of the unnecessary guidelines. The last step of this rather simple step will be extremely simple. Here we just need to paint the bows on the hair and add small areas of shadows with the help of dense hatching. 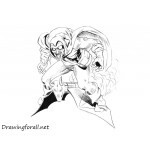 What other characters from comics and cartoons would you like to see on the page of drawingforall.net? You may write to us about it in the comments to this very tutorial or in our social networks.